We are excited to announce the launch of APSPARKS.com FULL version! 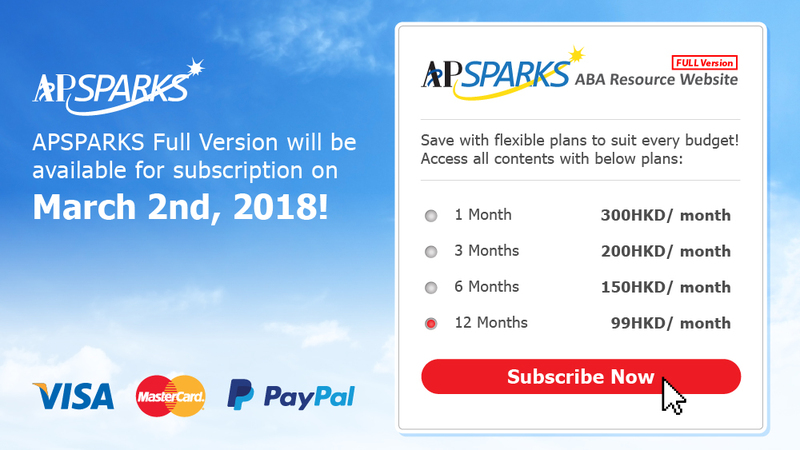 As an APSPARKS Paid Version member, you will have unlimited access to FULL content including ABA videos, materials and articles. New resources will be updated weekly. Subscribe as our Paid Version Member Now! Early Bird Discount – Up To 50% Off! Now we also offer an additional Early Bird Discount upon subscription to 1 month or 12 months plans before March 31st, 2018. Visa and MasterCards are accepted for payments. All payments are processed by Stripe our Payment Service Provide (PSP). Simply add your credit card details in the payment flow to make a payment. *APSPARKS.com is now only available in English. Chinese Version will be available soon. Please stay tuned.